You seem like a hip and happening dude that's totally down with counterculture values. You should definitely start dressing in a way that expresses your differences. Use this coming Halloween as a test run for some new threads. Take a good look at this stellar Red Dashiki Shirt. It's casual, it's colorful, it's a perfect start or finish for a classic hippie or a funky hipster outfit! This loose-fitting pullover shirt will rest comfortably on your shoulders like a sunset hanging on the horizon. The various beautiful patterns will have everyone saying 'far out' when you enter the party scene. Grab a gnarly headband and some awesome shades and you'll be ready to spread good vibes everywhere you go. Peace and love, man. That's what it's all about! 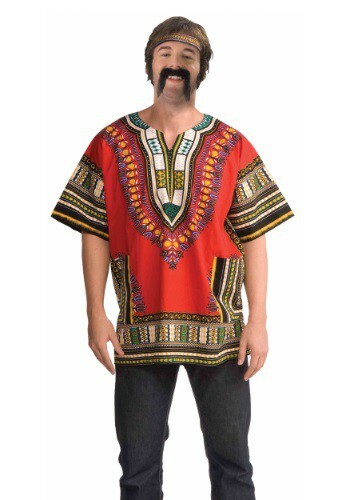 If you think so too then really show it by going out for Halloween wearing this Red Dashiki Shirt. You'll be the hippest hippie on the scene!